Fairly easy pattern with only 2 alternating stitches, that are again alternated on each alternate row. However, all the alternating can get confusing, so here are some constants. The rows in between are all purled. 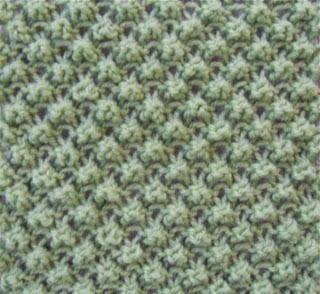 These purled rows are on the public or right side (rs) of the stitch pattern. So, if the right side is facing you, while knitting the next row, you know it is a purl row. When the reverse, wrong side (ws) is facing, you will start with the alternate stitch of the stitch you started with on the last reverse side row (i.e. 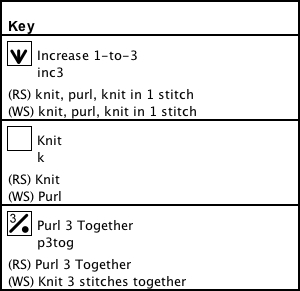 - if row 4 started with p3tog, row 6 will start with inc3).